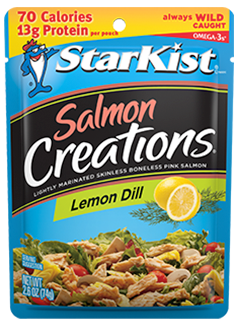 Premium skinless, boneless, and 100% Wild Caught Pink Salmon seasoned with a classic combination of lemon juice and dill for a light, fresh flavor! Packed in our no-drain, flavor fresh pouch, it’s easy to take this natural source of Omega-3s anywhere and eat anytime. Enjoy on a salad, in a sandwich, on crackers, or right from the pouch!